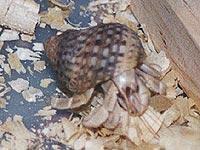 CRAZY CRABS are land hermit crabs. They do not live underwater like their marine cousins. They live on land, breathe air, and drink fresh water. CRAZY CRABS breed by scattering their eggs into the water. The eggs develop in the ocean as part of the plankton community. They return to land after a few years once grown to the size of a pea. They cannot breed in captivity. CRAZY CRABS are excellent climbers, so should be kept In a suitable container such as a fish bowl, or glass aquarium. Smooth sides will prevent escapes. CRAZY CRABS require fresh drinking water daily In a shallow dish. CRAZY CRABS need a weekly saltwater bath to replenish the salts within their bodies. They do not drink the saltwater, only fresh water. CRAZY CRABS will consume around a match head of food per day. They like a varied diet Including fruit & vegetables. Crazy Crab Chow is a great base diet. CRAZY CRABS are a hermit crab, they swap and change shells throughout their lives. Larger shells need to be provided as the crabs grow. Crazy Crabs grow around 3-5mm per year. The shed their skin each summer to grow. CRAZY CRABS are NOCTURNAL, spending the hot daytime hours buried under the vegetation In the sand dunes. They venture down to the shore at night to search for food, checkout larger shells and to socialise with their friends.